Essex Yeomanry were involved in the Battle for Monchy le Preux in April 1917. This battle took place as part of the battle of Arras during which the Essex Yeomanry were part of the 3rd Cavalry Division. Monchy le Preus was a small market town about 3 miles north east of Arras that was of strategic importance as it was set on a hill. On 11 April the town was taken from the Germans by the 37th Infantry. The 3rd Cavalry Division attacked the enemy positions on the surrounding heights but were beaten back by stiff resistance. During this attack lance Corporal Harold Mugford who had recently transferred from the Essex Yeomanry to the machine gun corps carried out heroic actions that led to the award of the VC. They then garrisoned the town with orders to hold it against the expected German attack. Their defence of the town over the next day was to be one of their finest moments in the war. When they entered the town is was virtually undamaged but by the time they were relieved 18 hours later the town was in ruins. 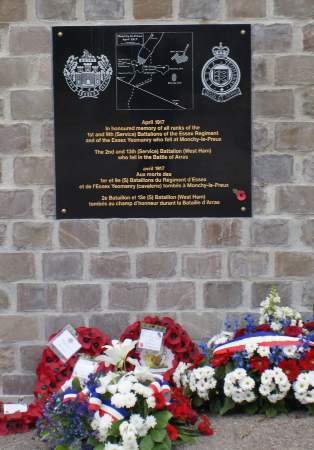 Troops allocated to the defence of the town were three squadrons of the Essex Yeomanry and two squadrons of the 10th Hussars and a party from the Northants Yeomanry plus a few remaining members of the111th and 112nd infantry Brigades who had remained in the town after its storming. Colonel Whitmore arranged the defences and during the morning sent a series of messages asking that that the Brigade send reinforcements and artillery support as the town was being ringed by German forces and the town was being bombarded by enemy shells and the defenders pinned down by enemy machine gun and rifle fire. No reinforcements arrived although at 1pm intelligence was gained from an aeroplane that the Germans were massing to the south of the town. A search of the town revealed 4 machine guns which were operated by remaining members of the Infantry and would play an important part in the defence. Finally a squadron of horse guards was sent to help but that was caught by an enemy barrage outside the town and most of its Officers and men died. The town now came under attack from enemy aircraft who flew over the town shooting horses and me with machine guns. By 6.30pm Colonel Whitmore reported that the strength of The Essex Yeomanry and the Hussars was now about 85 men each and that his men had not has food or drink for 24 hours. After dark patrols revealed that the Germans were digging in about 200 yards from the outskirts of the town but there was no let up in the German assault. At about 11pm the 37th Brigade arrived to take over the defence. although due to the situation some of the units remained in their positions until the next day when the situation quietened enough for them to be relieved and make their way out of Monchy. Casualties 1 Officer killed and 12 other wounded; other ranks 18 killed , 94 wounded and 10 missing. A total of 135 casualties. Most of the Yeomanry horses had been killed. Colonel Whitmore later had the honours of commanding the 10th Hussars and became the only territorial Officer to command a regular cavalry Regiment. He went on to become Sir Francis Whitmore and was Lord Lieutenant of Essex from 1936 to 1950. After the battle a Personal note was sent to Colonel Whitmore from Lord Tweedmouth who was acting Commander of the 8th Cavalry Brigade after the death of Brig General Bulkeley Johnson in the battle. "It is a source of the greatest regret to me that General Bulkely Johnson was nor there to see and approve the gallant manner in which the Essex Yeomanry and 10th Hussars took and garrisoned Monchy under most difficult circumstances repelling two counter attacks, under heavy shell fire and machine gun fire, and consolidating their position was to effectively deny a much coveted position to the enemy. The courage and determination of all ranks were most notably conspicuous and their coolness during a long and trying day beyond all praise. I would like to emphasize the fact that the success achieved that day was entirely due to your admirable dispositions and the gallant manner in which they were carried out." 70 men had their names entered in the War Diary for their conduct during this battle. Privates C H Ridgewell, W G Gardiner, H Thorn, A D Page and C F Johnson. Privates F Austin, H Burns, H C Cordell, J Caines, T H Curtis, A J Claxton, H Digby, A W Hawes, F Last, H T Moss, E Rampling, C Self, S E Peacock, B G Steward, O t Sutton, W Watts, E Tompkins, C N Ridgewell, P Pryke, R P Sandbrook, A S Rutland and W J Pleasant. Lance Corporals J N Bucknell, F T Kavanagh, W W Bunting, E Finch, A Hazell, W A King, W Roper, H Shrimpton, E W Smith, C E Wood, D Wood. Corporals G E Rowell, J Barbour, C J Bruce, J A Cowell, G C Foster, Hooper, D Holl, F Hobrough, D Matthams, D S Saville and M J Whiffen.